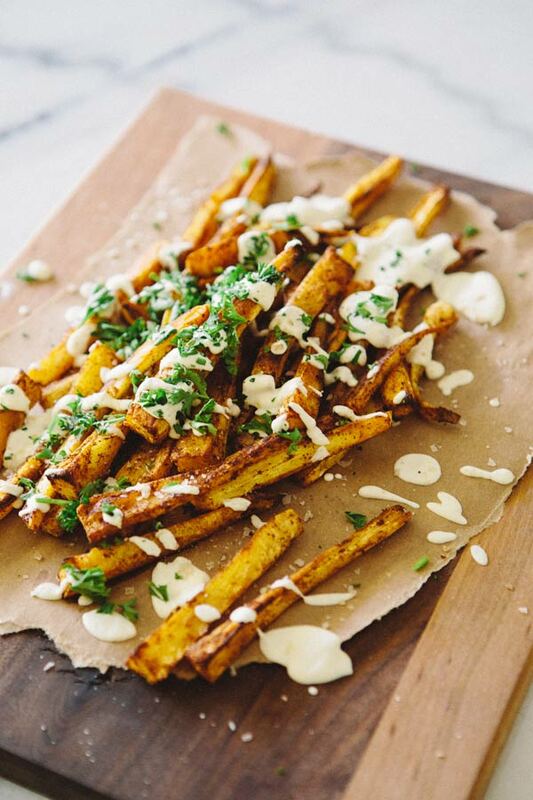 – Peel parsnips and slice into fries. – Roast for 25 minutes, toss parsnips and turn up oven to 500 degrees. – Wait for temperature to rise and cook for an additional 5-10 minutes until crispy. Keep a close eye to make sure they don’t burn. – While parsnips are roasting combine cashews, preserved lemons, salt and almond milk to blender. Blend until creamy, adding more almond milk if needed to achieve a consistency you’re pleased with. Add additional salt to taste. 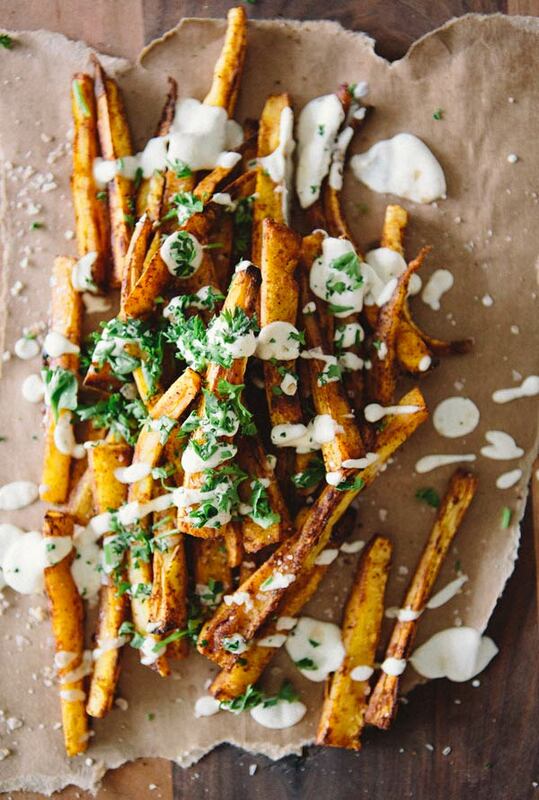 – To serve, spread fries over plate or serving platter, drizzle cashew cream sauce over top, sprinkle all with maldon salt and garnish with a small handful of fresh chopped curly leaf parsley. Enjoy! * notes: this recipe makes enough to have leftover cashew cream sauce- because it’s SO good and why would you not want to have leftovers for future sandwiches, brown rice bowls, etc?! But if for some crazy reason you don’t- halve the cashew cream sauce recipe for a serving more appropriate for this recipe alone. Oh boy. This is so happening sometime soon. I didn't think fries could get any better! Such an interesting combination of flavors I love – can't wait to try these! so adding this to my list of things to make. looooooove parsnips. yum yum yum. it is so nice to make potatoes in new ways!!! oh my gosh i am DROOLING. definitely pinning to try sometime. Mmm … the photos are making me so hungry! Looks delicious and I can't wait to try the cashew sauce. This is the first recipe/dish that's ever made me want to try parsnips! I just recently tried parsnip fries for the first time in Vancouver BC a few months ago. Wow, they were delicious! They've been on my "must try recipes" list ever since! Absolutely love the styling and the recipe. Once again, you have amazed me with this delicious and clean recipe–can't wait to try! Any recommendations for sauce without nuts? 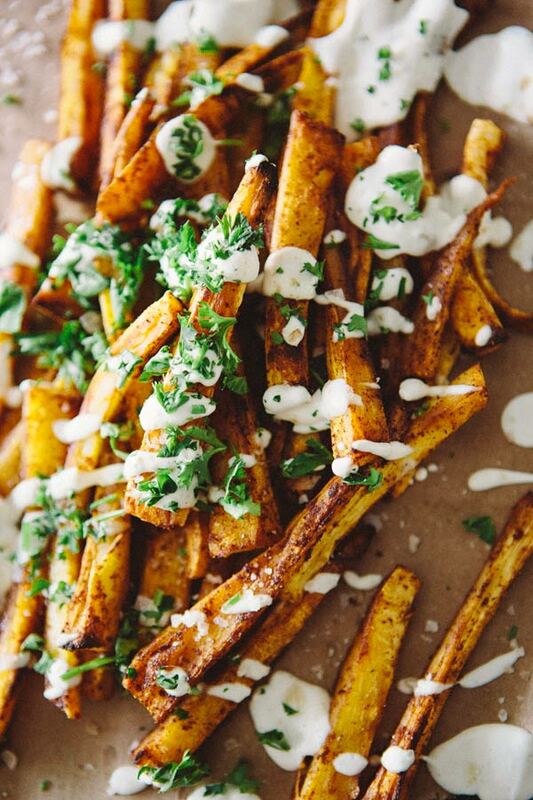 Love these parsnip fries. 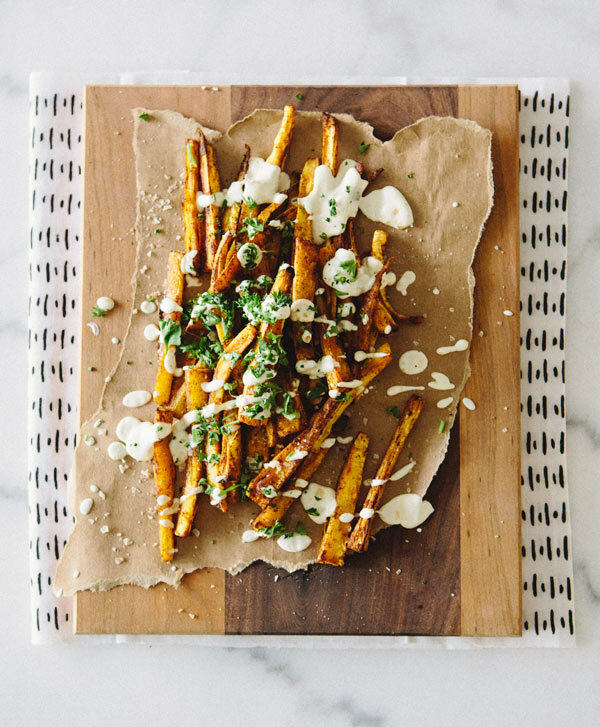 I made similar vegan sweet potato fries with a cashew aioli a while back. I used smoked paprika and convinced my meat eating husband that I had fried the sweet potatoes in bacon fat. He believed me! these look divine! a total snack and still healthy. love it! i have been dying to make a cashew aioli to dip sweet potato fries in, and i think i may have found the perfect start! gorgeous pictures (as always! ), thanks for sharing. These look utterly amazing! I can't wait to prepare them! Thanks for sharing. These look uber amazing, making them asap. Thanks for the recipe. 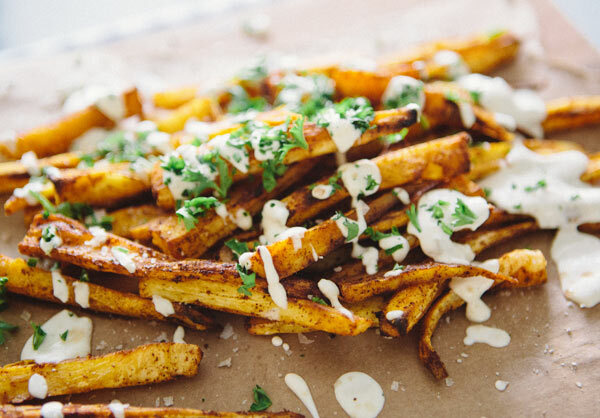 I tried this recipe last night, and I was amazed at how well the fries crisped up. The fries slightly reminded me of sweet potato fries, but the crispy, caramelized texture is much better. For the cream sauce, I used 1 1/2 lemon juice (rather than the preserved lemons), which worked well. I also added a bit of parsley and cilantro the sauce to add some freshness. I made the sauce the night before, and it still turned out beautifully the next day. I will be making these again, no doubt. Cheers! These were SO yummy! Tried these this week and this is definitely a recipe we will be making again. We didn’t have any cashews handy and we aren’t vegans, so we used some fat free yogurt to make a garlic and lemon dip, which was great with the peppery taste of the parsnip. Next time we are definitely going to try the cashew sauce, because that sounds seriously yummy! Can you specify how much almond milk. I’m not understanding what 1/2 cup tablespoon of almond milk means. Thank you. Learn how to make this delicious Radish Risotto in this cooking video brought to you by Miedema Produce. If I don’t have preserved lemons, can I use something as a substitute? what is the measurement for the almond milk?